Luis Alvarez was a Nobel Prize winning physicist, probably most famous for the discovery of the iridium layer and his theory that the mass extinction of dinosaurs was caused by an asteroid or comet colliding with Earth. Besides doing the normal work you might expect of a physics professor, Alvarez took on more unusual projects, like making use of cosmic rays to search for hidden chambers in an Egyptian pyramid. Luis Walter Alvarez was born on June 13, 1911, in San Francisco, California. His father, Walter Clement Alvarez, was a doctor and author who wrote a large number of medical books. His mother was Harriet Smyth. Luis began his education in San Francisco, first at Madison School, then at San Francisco Polytechnic High School. In 1926, when he was 15, his father changed jobs and the family moved to Rochester, Minnesota. Luis graduated from Rochester High School, then started a Bachelor of Science course at the University of Chicago in 1928, intending to major in chemistry. After a couple of years, his grades in chemistry were not as good as he had hoped – he was scoring Bs. Also, he had also grown much more interested in physics, so he decided to major in physics instead. He graduated with a B.S. in physics in 1932, then continued as a graduate student at Chicago, where he was awarded a master’s degree in 1934, and a Ph.D. in physics in 1936. Even at the beginning of his time as a graduate student, Luis Alvarez was at the cutting-edge of physics. His doctoral advisor was Arthur Compton, winner of the 1927 Nobel Prize in Physics for his discovery that electromagnetic radiation, such as visible light, has particle-like properties. In 1932, Alvarez built an array of Geiger counters to study cosmic rays. In 1933, using the data he had gathered, he and Compton published a paper in the Physical Review establishing that cosmic rays are positively charged particles. Compton gave much of the credit for the work to his young graduate student. After completing his Ph.D. in 1936, Alvarez returned to his home state, beginning work as an experimental physicist at the University of California’s Radiation Laboratory in Berkeley. Luis Alvarez was a highly talented and highly imaginative experimental physicist. He had a particular talent for devising experiments that asked questions in such a way that Mother Nature felt compelled to give a good answer. One of the ways radioactive atoms transform into new elements is capture of an orbiting electron by the nucleus. The electron combines with a proton to form a neutron. The atom now has one proton fewer than it used to, and so has become a new element. This process had been predicted by theorists but never observed. In 1937 Alvarez devised a new experiment to ask Mother Nature whether the process really happened. He looked for the X-rays expected to be emitted by a nucleus when it captured an electron. The experiment worked and K-electron capture became an established phenomenon in physics. If carbon-10 could undergo K-electron capture, the result would be as shown above. A proton in the nucleus would capture an electron and be converted to a neutron; the nucleus would become boron-10. Luis Alvarez proved that K-electron capture was not just another theory – it actually happens. Alvarez spent a lot of time at Berkeley working with the cyclotron (particle accelerator/atom smasher). He was able to prove that helium-3 is stable, although it had been predicted to be unstable. Alvarez was an enthusiastic pilot; he learned to fly in 1933. In the early 1940s he invented the Microwave Phased Array Antenna. This was a form of radar that gave ground crew unparalleled precision in determining the position of an aircraft in flight. 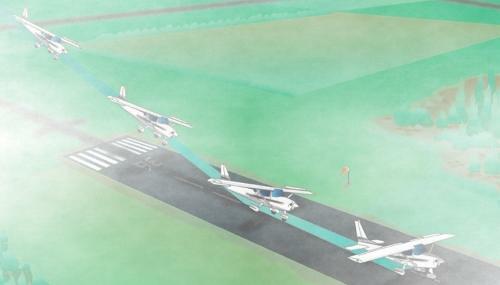 The invention allowed ground crew to give clear instructions to pilots as their aircraft approached runways preparing to land. The system was particularly useful when visibility was poor, such as in fog, or other adverse weather, or when pilots were inexperienced. Alvarez’s invention was used by the military and civil authorities in various countries for decades, greatly enhancing air safety. Alvarez’s ground-controlled approach radar allowed airplanes to be talked down by air traffic controllers when visibility was poor. In 1943, during World War 2, Alvarez was asked if it would be possible to tell scientifically if Germany had its own atom bomb project. 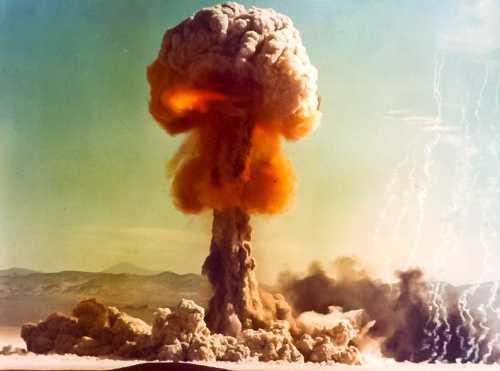 He knew that research and development into atom bombs produces radioactive gases, such as xenon-133. These gases could be detected with the right equipment; and Alvarez was an equipment expert. He said aircraft should fly over Germany carrying radiation detectors to detect the telltale gases. The flights took place and found no evidence Germany had an atom bomb project. Alvarez’s method was used after the World War 2 to detect atomic research taking place around the world. In 1944, Alvarez arrived at Los Alamos, New Mexico, to work on the Manhattan Project. There he devised an electrical detonation method for the plutonium bomb. He and his graduate student Lawrence Johnston also designed equipment to measure the energy released by a nuclear explosion. The two scientists flew in an observation aircraft to Japan when the bombs were dropped to measure how powerful the nuclear explosions had been. Luis Alvarez devised the first method to discover if a country is carrying out nuclear weapons research. He also devised the first method of measuring how powerful a nuclear explosion has been. When the war was over, Luis Alvarez moved back to Berkeley as a full professor. He was soon busy again with experimental physics. It was an exciting time to be in particle physics, and the atom smashers at Berkeley made it an ideal place for new discoveries. When Alvarez first went university, only two fundamental particles had been known: the proton and the electron. By 1932, the year he completed his degree, the horizons of particle physics had widened greatly with the discovery of two new particles: the neutron, discovered by James Chadwick; and the positron, discovered by Carl Anderson. Further discoveries – K mesons and hyperons – expanded the particle world in the late 1940s, and by 1950 the pion family of particles had become known. These discoveries relied on a device called the cloud chamber, in which subatomic particles left vapor trails. One day in 1953 Alvarez got talking to a young physicist. The young man was Donald Glaser. Over a meal at a conference, Glaser told Alvarez about his new invention – the bubble chamber – which was an improved way of tracking subatomic particles. Glaser would go on to win the 1960 Nobel Prize for this invention. Alvarez thought about what Glaser had told him. Glaser had used a bubble chamber filled with liquid ether. Alvarez decided that a bubble chamber filled with liquid hydrogen would be a perfect way of tracking particles coming out of an accelerator. The idea was that the liquid hydrogen would boil wherever a high energy particle passed through it, leaving a trail whose path would allow the particle’s properties to be calculated. By early 1954, Alvarez had put together a small-scale liquid hydrogen bubble chamber at Berkeley. Fermilab image of tracks left by subatomic particles passing through a bubble chamber. Physicists can figure out the properties of particles by studying the trails they leave. 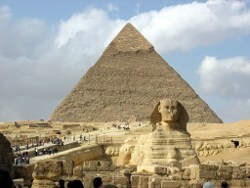 The Pyramid of Chephren, with the Sphinx in the foreground. Image: Hamish2k. In 1967, Alvarez had the ingenious idea that hidden chambers in Egypt’s pyramids could be revealed by making use of cosmic rays to take a X-ray type photo. He placed a cosmic ray detector in an existing chamber below in the Pyramid of Chephren – the second largest of the Pyramids of Giza. The rate that cosmic rays arrived at the detector would reveal any spaces within the pyramid’s structure. Alvarez was able to study about one-fifth of the pyramid’s volume, but found no new chambers. Alvarez’s son Walter, like his father, had become a scientist. Walter was a geologist, and one day in 1977 he decided to tell his father about a problem he had. His problem was called the K-T boundary, a gray colored layer of clay found in rocks. This clay layer was unusual, because it was found all over the world, and it was the same age everywhere, meaning the layer had been made all over the world at exactly the same time – 65 million years ago. And even better, from Luis’ perspective – because he loved scientific puzzles – was that below the layer you could find dinosaur fossils in the rocks, but above the layer there were no dinosaur fossils. Dinosaurs and many other lifeforms that existed before this layer of clay was formed were extinct afterwards. This was not a new problem. The boundary and the change of lifeforms on either side of it were noticed in Paris in the early 1800s by Georges Cuvier, who proposed that some catastrophic event had caused the clay layer. However, Cuvier’s ideas became unpopular because the new science of geology was governed by the uniformitarianism doctrine – the belief that all changes in the earth’s geology happen gradually. 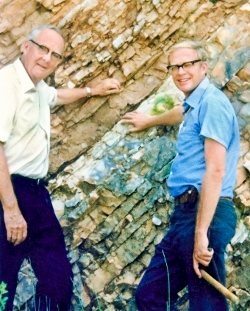 Luis and Walter Alvarez at the boundary layer that marked a mass extinction of life on Earth. After discussing the problem, father and son started off with a rather modest goal. They wanted to determine how long it took for the 1 centimeter deep layer Walter had been investigating in Italy to form. Luis decided the best way to do this would be to measure how much of the chemical element iridium was present from the top through to the bottom of the layer. Iridium in the earth’s crust comes mainly from meteorite impacts, and Luis had calculated the average amount of iridium that arrives on Earth each year from meteorites. Comparing iridium levels in the layer with typical iridium arrival rates would tell him how long it took for the layer to form. Luis asked Frank Asaro, a nuclear chemist at the Lawrence Berkeley laboratory, to determine the iridium content of samples of gray clay from the K-T boundary layer. Asaro and his nuclear chemist colleague Helen Michel found much higher concentrations of iridium in the samples than anyone could have imagined, much more than could be explained by the normal number of meteorite impacts. In 1980 the team published their evidence and stated their belief that the K-T boundary layer and the mass extinction event had been caused by a massive meteorite impact. Luis Alvarez calculated a 10-kilometer-diameter meteorite traveling at 25 kilometers per second hit Earth 65 million years ago. The impact sent a huge volume of rock dust into the atmosphere which eventually settled to form a thin gray layer all over the world. While the dust was in the atmosphere it blocked the sun’s rays, putting a stop to photosynthesis, and cooling the planet. Without food and heat, the dinosaurs died out. Very high levels of iridium in the K-T boundary lay suggested an extra-terrestrial origin for the event that wiped out the dinosaurs. Most paleontologists were unconvinced by Alvarez’s explanation of the mass-extinction’s cause. It is fair to say that the debate between paleontologists and supporters of the Alvarez theory was fierce and raw. There was a large amount of ill-feeling in the opposing camps, not helped, it must be said, by Luis Alvarez himself. Alvarez was generally cantankerous and dismissive of anyone with a view different from his own. I don’t like to say bad things about paleontologists, but they’re not very good scientists. They’re more like stamp collectors. In 1990, two years after Luis Alvarez’s death, the Chicxulub crater in the sea off Mexico’s Yucatan Peninsula came to the attention of geologists, who agreed that the profile and age of the crater matched the Alvarez predictions. The meteorite impact itself is no longer a topic of debate. It is completely accepted that Alvarez’s team was right about this. Whether the mass extinction was caused mainly or exclusively by the impact is, however, still debated. There is an alternative theory that the extinction might have been assisted or even wholly caused by another catastrophic event, namely the enormously violent volcanic eruptions that took place in the Deccan Traps in India in the same geologic time frame as the meteorite impact. Someday, no doubt, the debate over the cause(s) of the mass extinction will be settled, but it hasn’t been yet! Luis Alvarez died of cancer of the esophagus at the age of 77 on September 1, 1988. He was survived by his first wife Geraldine Smithwick, and their children Walter and Jean; and his second wife Janet Landis, and their children Donald and Helen. 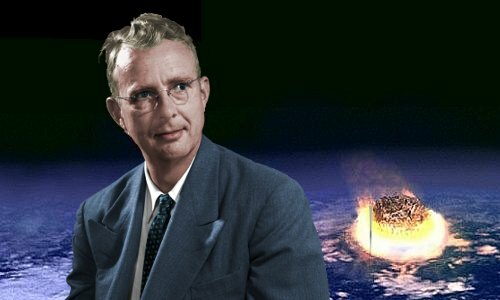 Images of Luis Alvarez enhanced and colorized by this website. "Luis Alvarez." Famous Scientists. famousscientists.org. 1 Dec. 2014. Web.